I've a Drupal 8 (8.5.4) site which is using a custom created on top of Bootstrap Barrio. I'm using Easy Breadcrumbs module. Here is the configuration I used. The default homepage in /admin/config/system/site-information is set as node. Nothing is added in "No Results Behavior" for the view "FrontPage"
The problem is when I go to http://localhost (place where my site is hosted), the breadcrumbs are not rendered. 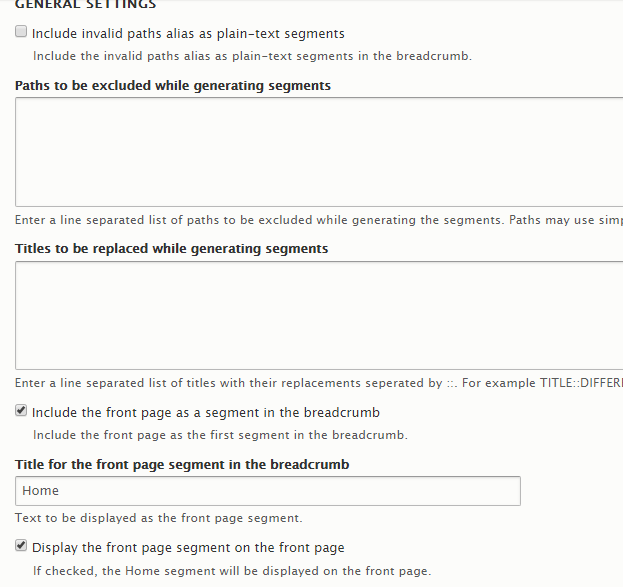 I'm expecting it to show the text "Home" in the breadcrumb region, as configured in Easy Breadcrumb settings. However on rest of the pages, the breadcrumb shows the breadcrumb for the page preceded by Home. Browse other questions tagged 8 breadcrumbs or ask your own question. How to translate the Home link when using Path Breadcrumb? Why does getActiveTrailIds() return nothing for view pages?